An earlier version of this post appeared in my weekly Housing Notes, March 15, 2019 edition. I’ve since added more information and insights as the situation unfolds. This proposed “pied-a-terre” tax law has a name that infers it concerns “pied-a-terres” when in fact that property type is but one part of the property types that are impacted. I’m sorry about the length of this piece but please read on. The New York political zeitgeist was recently and suddenly tilted against luxury development in New York City. If this latest turn of events plays out as written, we’ll be able to look back at this era as a milestone where the supertanker began to turn in the wrong direction for the new development industry. Gov. Andrew Cuomo’s office suggested last week that such a levy might reap $9 billion for the moribund Metropolitan Transportation Authority over the next decade and Assembly Speaker Carl Heastie reiterated his chamber’s support proposal at a Crain’s breakfast forum days later. Mayor Bill de Blasio gave it his blessing as well. These owners bid up the price of NYC residential real estate, and since they don’t spend much time in these units, contribute little to the local economy compared to full-time residents. Wrong. A large swath of high-end condo market activity of the past five years are non-primary residences which include pied-a-terres but most are investor purchases that are subsequently rented after the unit closes when construction was completed. The majority of new development units purchased as non-primary were rented out which is why the high-end rental market was crushed by all the new development condo sales by investors. Renters in these units do spend and help drive the local economy. Manhattan is about 75% rental by unit and New York City is about 2/3 rental by unit. It is therefore clear that renters drive a large swath of the NYC economy. Why would renters of high-end apartments be any different than all renters? They eat, sleep, work, and consume. FPI’s apparent belief that most of the high-end development sold ended up as empty pied-a-terres while wealthy buyers bid up the prices is incorrect. This position seems to be derived from one of only two references cited in the FPI white paper, a fun New York Magazine cover story by Andrew Rice. That article came out in 2014 right as the housing market was peaking. The strengthening dollar was cooling demand via international currency plays and the sight of cranes rising everywhere told buyers that an oversupply was here (that still exists today with over 6 years of excess new development product. I was one of the resources for Andrew Rice’s piece and here I explain what happened leading up to the 2014 condition which I later dubbed “Peak Luxury” and “Peak New Development”. Much of this speculation is being driven by two factors: sparse supply, due to the absorption of the inventory left over from the last boom, and fast-rising prices. 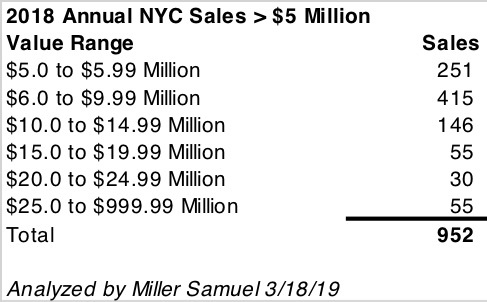 Manhattan saw a 30 percent price increase over the past year, on average, which market analyst Jonathan Miller attributes primarily to sales closing in ultraluxury buildings. The highest end of the market has seen stunning inflation. In other words, the 30 percent price rise wasn’t a “bid up” by wealthy buyers; it was a massive shift in the type of housing stock that was being created and sold. New building materials and engineering enabled 100 story buildings instead of 50 story buildings. Landowners factored this into land prices since many buildings above the 50th floor had expansive open views and (not enough) buyers were willing to pay for it. Prices rose significantly in lower-priced segments (below $5 million) because supply was static and no match for a rising population and the city’s record job growth. Developers are in the business of developing, and land prices remained high after the housing bubble burst a decade ago because of the large amount of money that was flooding into development. Central banks worldwide pressed rates to zero, creating an army of global investors chasing higher returns. To keep developing despite all this new capital, developers had to build what land prices required, high-end real estate. Developers would create affordable housing if it realized a higher return on the risk they take on. While it has always been difficult and expensive to build in New York City, the post-financial crisis was especially challenging with heavy competition for labor, materials, and land, exacerbated by free-flowing global capital in a low-interest-rate world. Now the buyers of this real estate, who committed to New York City, are being punished by this new tax, the result of which will damage the city’s global brand that took 25 years to evolve. Why? Because a white paper with only two reference citations, one of which was a magazine article on a small niche of super-tall buildings, was the basis. I am also concerned that the paper did not address the change in consumer behavior when such taxes would be implemented. Why would they push to implement a new tax when it raises the probability that existing tax revenues will fall? To get specific here’s what happened after this article was written. The building known as One57 on the cover of the cited New York Magazine story – 5 years later and after 8 years on the market is 25% unsold and resale activity (the same unit purchased from the sponsor and then sold again) shows as much as a 30% drop in prices since this article was written. This drop is why I think that the implementation of this new tax as written will be catastrophic to the market, potentially causing it to seize up. As a result, the city would see a significant drop in transfer tax and other associated revenues before considering the new tax. Hit a declining market with more than 6 years of excess supply with a new high tax out of the blue and watch what happens. March: Introduction of the Fiscal Policy Institute’s 2014 “pied-a-terre” tax proposal for properties valued at or above $5,000,000 in New York City, was introduced in the Senate. 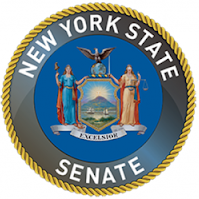 The proposed law is in each New York State Albany chamber right now and although they have different introduction dates of January 9, 2019 (Senate) and February 4, 2019 (Assembly) they look the same. 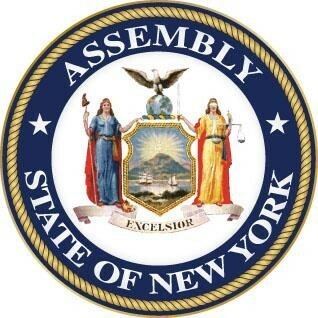 The New York State Assembly version: Assembly Bill A4540 or in this format. The New York State Senate version: Senate Bill S44 or in this format. The bills are short on details and are currently in committee, wide open for interpretation. As written, the bill is both sweeping and ominous to the real estate industry in New York City, and I expect it will result in less overall tax revenue to the city than currently enjoyed. I’ll get into that further on. I am not a tax advisor, and anything I say here should not be relied on, and you should seek appropriate counsel. Seriously. I am merely interpreting what I think are the critical issues established this proposed tax. This tax directed is specifically at New York City because it is designated for cities in the state with populations of more than 1 million. 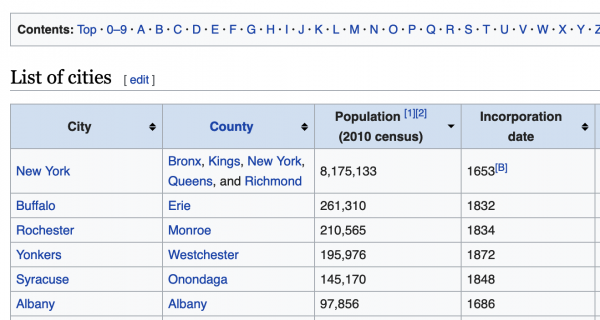 As evidenced by the 2010 census data in Wikipedia, there is a significant population difference between New York City and Buffalo. 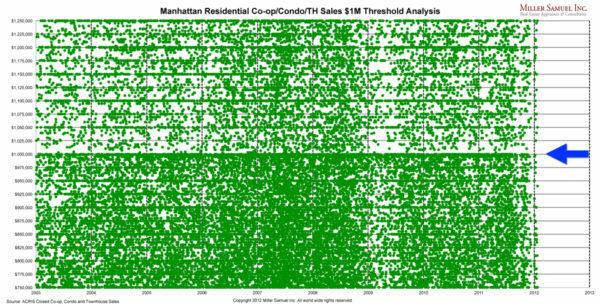 The market value of these properties will be based on a “comparable sale-based valuation method.” which seems in direct conflict with state law since co-ops and condos are valued as rentals by state law in NYC. You probably think of the market value of your co-op or condo as the price you could sell it for on the open market. However, State law requires us to value residential cooperative and condominium buildings as if they were rental apartment buildings. This means that we look at the income and expense statements of rental buildings that have similar characteristics to determine your condo or co-op buildings market value. It taxes residential properties valued at $5 million and above in NYC, most of which are in Manhattan. And it is a marginal rate tax – only the amount above each threshold is taxed. And it is a property tax which means it will be paid annually, not just upon sale like the Mansion tax. 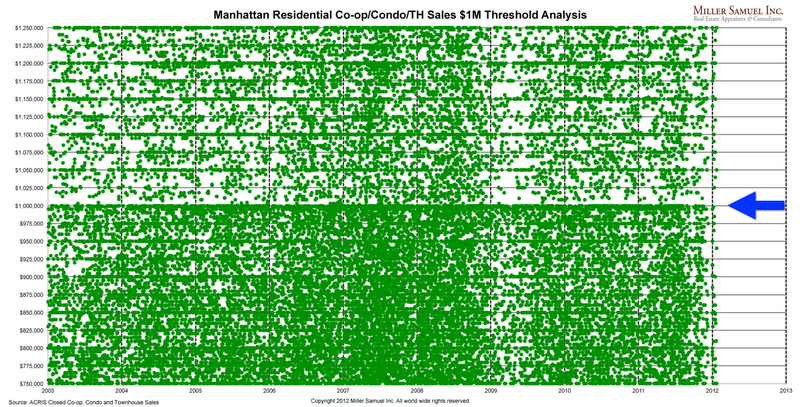 Here is how consumer behavior is impacted by the $1 million threshold of the New York State “Mansion” tax. I did this a while ago, and the pattern still exists. As an annual property tax, the dollar thresholds will be more firm. The tax is not really about pied-a-terres. It is a tax on non-primary residences as written. Therefore it should apply to investor units and LLCs. I don’t think it is unreasonable to assume that the language of the bill infers that LLCs could be interpreted as “non-primary residences” even if they are used for primary residences since New York State defines LLCs: An LLC is an unincorporated business organization made up of one or more persons. That definition does not sound like a primary residence to me. Although the working title of the proposed tax is “pied-a-terre” there is no mention of this particular use in the Senate or Assembly tax bills. They specifically refer to “non-primary residences” so that would include other uses like investor units and possibly LLCs (possibly even those used as primary residences). It’s all still up in the air at this point. In 2017, New York City had 75,000 pieds-à-terre, up from 55,000 such units since 2014, according to the New York City Housing and Vacancy Survey. The share of vacant apartments that are classified as pieds-à-terre has held steady during that time at about 30 percent. There are only 5,400 units in New York above $5 million that are owned by non-residents. For the year 2018 my ACRIS search yielded 952 residential single units sales (1-3 family, co-ops, condos) above the $5 million threshold (1,188 in 2016 and 1,173 in 2017). I will assume that the Senator included all the apparent nuances within the 5,400 count for the entire NYC housing stock (pied-a-terres, investor units, LLC-owned primary and non-primary residences). I projected this mix of sales as proportional to the 5,400 units impacted by the new law to break out the tax revenue calculations, understanding the 2018 sales included both primary and non-primary residential uses. 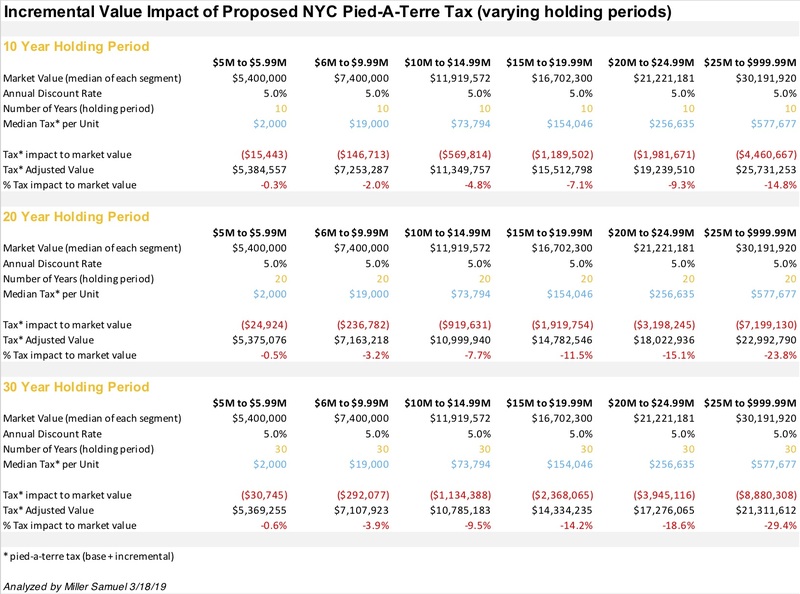 It was not immediately clear how much money the tax would raise; the office of the city comptroller, Scott M. Stringer, estimated that a pied-à-terre tax would bring in a minimum of $650 million annually if enacted today. And based on the expected revenue stream, Mr. Cuomo estimated that the state could then raise $9 billion in bonds, backed by the expected taxes paid by pied-à-terre owners. Based on my calculations, the tax-impacted housing stock would yield tax revenue of roughly $455,000,000 which is about 30% below the $650,000,000 estimate assuming this new tax would not impact any current consumer behavior of the wealthy who would be affected by the tax… which is a GIANT assumption that is patently not true. Using the median sales price of each price traunche set up in the bill, and assuming a 5% discount rate and the median tax for each traunche and a 10 year holding period, the adverse impact to value rises in each higher traunche. I’ve added 20-year and 30-year holding period versions using the same variables. I started out using the 10-year as a placeholder for the brokerage industry’s default assumption of 7 years for homeownership but then added 3 more years to account for the current market slide. The 20 and 30-year holding periods assumptions might be more realistic given the long term view of investors after the decline in prices of the past several years and the phenomenon of capital preservation in this latest development frenzy since 2012. If that’s the case, properties valued at $25 million or higher might lose 30% of their value overnight…not factoring in a market pause or even collapse in sales until the terms are ironed out. That period of uncertainty starts now through July 1, 2020. Moses Gates, a vice president at the Regional Plan Association, disputed the notion that New Yorkers would leave the city. The association believes that most wealthy pied-à-terre owners would pay the tax. If they chose to sell, then the property has the chance of being purchased by a full-time city resident, who would then be subject to income and sales tax. It is already happening. His assumption does not take into consideration the new federal tax law enacted on January 1, 2018, that was especially punishing the wealthy real estate property owners that were already considering moving their domicile to a low tax state like Florida. The wealthy who already were on the fence before the new law are now beginning to make their moves. You can see this happening in Florida right now. New Yorkers are the new foreign buyer there. 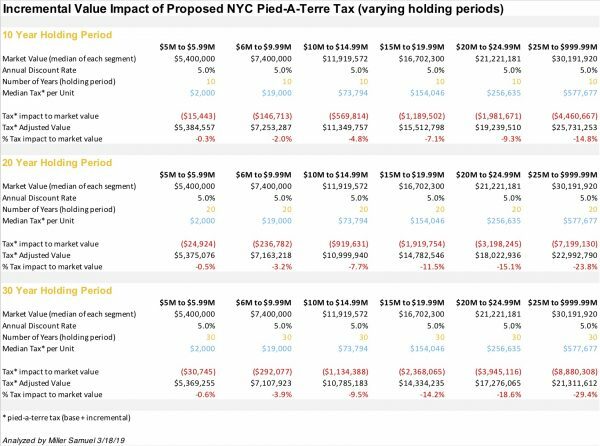 This proposed pied-a-terre tax piles on to the fresh new federal taxes just served to wealthy property owners in NYC metro last year, and sales were already slowing. The trend of raising tax revenue on real estate of the wealthy is gaining momentum worldwide. New York City had the distinction of being one of the few major global cities that have not implemented taxes that are openly hostile to foreign buyers or investors. Here is what some countries are doing to tax these buyers and it is slowing sales. Large cities around the world have been grappling with how to make wealthy absentee property owners pay for the privilege of owning secondary residences, a recent report from the Real Estate Institute of British Columbia shows. Sydney, Paris, and London have all recently added or increased taxes on the purchase of secondary homes. In Hong Kong, nonpermanent residents pay a 15 percent fee on the value of the home, and foreigners pay an additional 15 percent fee. Singapore has restrictions on the purchase of residential property by foreigners and a 15 percent tax. In Denmark, foreigners are required to obtain permission from the government to purchase secondary homes. In Vancouver, where the greatest concentration of vacant properties is downtown, owners of empty residential properties are charged a 1 percent tax based on the assessed value. This bill may obliterate future transfer tax revenue from real estate activity and could result in lower net receipts from the real estate sector in the aftermath. The 2014 whitepaper doesn’t consider this but instead presents the tax in a vacuum as if market forces don’t respond. Luxury real estate buyers do not ignore new taxes as is commonly pontificated. That never happens and I’m not sure where that form of conventional wisdom came from. As such there will be substantial damage to high-end property values going forward, perhaps as much as 30% if not more than that. With the news of this new tax, we expose the market to a panic selloff as existing owners look to take their lumps and get out as new sales pause. The damage to the housing market above the $5 million threshold will not be contained and will likely melt into the layers below it as market stigma expands. The suburban markets, as key competitors to NYC in the immediate area, may actually benefit within their respective high-end markets as NYCs brand damage and new tax may incentivize city buyers to look closer at alternatives in NYC suburban metro as well low-cost areas such as Florida. At a bare minimum, the guaranteed uncertainty of the bill’s final form from April 1, 2019 when it is enacted and July 1, 2020 when it is implemented, will help “pause” sales starting now. Sales at the top of the market will slow further than they already have. This uncertainty will have a significant impact on market participants as they wait for Albany to sort this out and will play a significant roll in impacting transfer tax revenue as the market cools further. There is a strong political appetite for this to be part of the budget. I can only imagine the heavy volume of lobbying and litigation activity to occur between now and July 1, 2020. There is a need/hunger for more revenue by the governor and the mayor for the MTA – which will include a lot of lobbying and litigation since everyone wants a piece of this. Unfortunately, the Real Estate Board of New York does not have clout in Albany political circles but they appear to be working hard to reduce the damage this bill will cause to new development (with a by-product of reducing the loss of existing tax revenues). Whatever happens to this bill, it will probably damage the credibility of the bill’s author, the Fiscal Policy Institute who will learn that market forces do matter and policy should never be considered in a vacuum. On a positive note, present circumstances included, the impact of this tax bill is so over the top and disconnected from market forces that I would expect the lawsuits and negotiation to be significant and improve the odds this bill will be converted into something less catastrophic. The Senator who is sponsoring this has seemed to suggest this in interviews. Remember the 1970s version of New York City? The success the city is enjoying now was the result of 25 years of proactive management of city spending and branding efforts. Besides record tourism, real estate activity has been revitalized and that has brought billions of dollars to the city coffers. The introduction of this new tax law ignores human behavior and assumes the tax revenues will rise as if market forces don’t exist. The wealthy will not shrug off these heavy new costs. They will simply go elsewhere. New real estate taxes, especially significant ones, change consumer behavior almost immediately. If the objective is to punish the high-end housing market and the development community, then this bill will do that. If the objective is to generate new tax revenue for MTA, it won’t. In fact, I believe it will cannibalize existing related tax revenue streams after all the mayhem it causes to the new development industry. Let’s hope economically informed voices are able to make themselves heard during this process. I’ll be providing additional insights on this important and developing issue in my weekly Housing Notes. You can sign up for free right here.